Ukrainian pilot cosmonaut 1997-2017. 547 cumulative days in space. 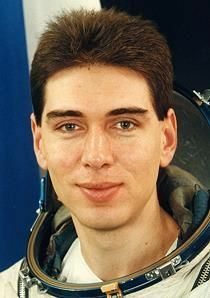 Son of cosmonaut Aleksandr Volkov. Status: Inactive; Active 1997-2017. Born: 1973-04-01. Spaceflights: 3 . Total time in space: 547.93 days. Birth Place: Chuguyev. Graduated from Tambov Marina Raskova Higher Military School of Pilots, 1995. Captain, Military Transport Aviation. Cosmonaut training completed November 19, 1999. PERSONAL DATA: Born April 1, 1973, in Chuguyev, Kharkov Region, Ukraine. Married to Natalia Volkova (Shinkarenko). They have one son, Egor, born in 2001. His hobbies include sport games, tennis, windsurfing, reading, museums. From May 2006 to April 2008 Volkov trained as an ISS 17 prime crew commander and Soyuz TMA commander. From December 2009 he has been training as a Soyuz TMA-M commander and ISS flight engineer in the ISS-25/26 backup crew. SPACEFLIGHT EXPERIENCE: Volkov performed his first spaceflight April, 8 – October 24, 2008 as Soyuz TMA-12 commander and ISS commander. During this flight JEM PM of the Kibo module and the JEMRMS manipulator were installed, and ATV-001 “Jules Verne” operations took place for the first time. Volkov logged 12 hours 15 minutes of EVA time in two spacewalks and logged a total of 199 days in space. Family: Cosmonaut. Country: Ukraine. Spacecraft: ISS. Flights: Soyuz TMA-8 ISS EP-10, Soyuz TMA-12, Soyuz TMA-02M, Soyuz TMA-18M. Agency: VVS. Bibliography: 4452, 6161. 1973 April 1 - . Birth of Sergey Aleksandrovich Volkov - . Nation: Ukraine. Related Persons: Volkov, Sergey. Ukrainian pilot cosmonaut 1997-2017. 547 cumulative days in space. Son of cosmonaut Aleksandr Volkov. 3 spaceflights, 547.9 days in space. Flew to orbit on Soyuz TMA-12 (2008), Soyuz TMA-02M, Soyuz TMA-18M..
2011 August 3 - . EVA ISS EO-27-1 - . Crew: Samokutyayev, Volkov, Sergey. EVA Duration: 0.27 days. Nation: Russia. Program: ISS. Flight: Soyuz TMA-02M, Soyuz TMA-21. Cosmonauts Volkov and Samokutyaev, in Orlan suits, entered space from the Pirs module. They deployed the RadioSkaf-V amateur radio satellite and installed the BTLS-N lasercom terminal on the Zvezda module and the Biorisk-MSN exposure package outside the Pirs module. 2016 February 3 - . EVA ISS VKD-42 - . Crew: Malenchenko, Volkov, Sergey. EVA Duration: 0.20 days. Nation: Russia. Program: ISS. Astronauts Malenchenko and Volkov carried out spacewalk VKD-42 from the Pirs module. The hatch was opened at 1255 UTC and closed at 1740 UTC. They retrieved the EXPOSE-R2 and SKK 2-M2 materials exposure experiments and installed SKK 3-M2 and two Vinoslivost panels. They also jettisoned a small package consisting of a bag of towels attached to a commemorative flash drive with videos about World War II to celebrate the 70th anniversary of 'Victory Day'. The inert package will reenter in a few days or weeks.